There's a chill in the air, and it's time to start baking! Something warm, comforting and delicious. Here's just the dessert. You'll love this one! I made this cake for Gary about 25 years ago. (and ever since...) It was a surprise for a his birthday. We weren't really even dating yet, but I think this may have sparked the flame. Our friends just celebrated their 45th anniversary and I made this for them. It's very romantic, and perfect for a party. The best news... I substituted Cup 4 Cup gluten free flour, for the wheat flour. It worked perfectly. No one could tell the difference including me. Here's the recipe that will make you a star as the holidays roll in. Everyone I know loves this cake. It's dense, very chocolatey, and even appeals to those who claim not to really like chocolate. You can serve it at room temperature or cold. Invite friends because one cake goes a very long way since it's so dense. The ingredients are pretty simple. Melted chocolate, butter, a dozen eggs, sugar and some flour. I bet I had you at melted chocolate. I used Cocoa Barry 58% French chocolate. Use any bittersweet/semisweet you like. Just not milk, it will be too sweet. My Lost Crates box this month from Joy the Baker, included vanilla beans, vanilla extract and a big bag of Cup 4 Cup gluten free flour by Thomas Keller. When Chef Keller does something, it's always great. The flour looks and feels like wheat flour. No funny taste, smell or texture. I would highly recommend going finding some right away and giving it a try. If you have a moment, follow the link to Lost Crates. It's always a surprise and very fun! Preheat your oven to 325 degrees F. Butter and sugar an 10 inch spring form pan. Tap out any excess sugar. Break or chop the chocolate into small pieces and melt in microwave or in a pan placed over another pan of barely simmering water. Stir until smooth, and cool slightly. Be careful not to burn the chocolate. Beat the egg yolks and sugar until they are pale and light yellow. When you lift the whisk or beater over the mixture, there should be a ribbon of the mixture that falls from the beaters and gently lays on top of the egg/sugar mixture. Add the chocolate and mix thoroughly. Stir in the butter, and flour. In another bowl, beat the egg whites until they are stiff. Spoon a spoonful of the chocolate mixture into the egg whites and mix. 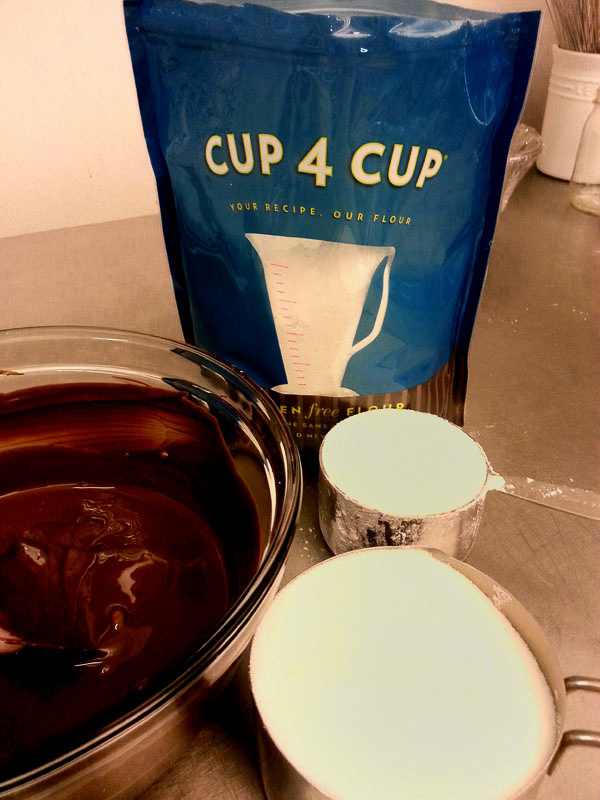 Then add the egg whites to the chocolate mixture, folding very gently until mixed. Be very careful not to overmix, or deflate the batter. Pour the batter into the prepared pan (it will come close to the top) and set on the rack (middle rack) and bake for 1 hour and 20 minutes. A cake tester or toothpick should come out clean when inserted into the center of the cake. The cake will rise and crack, but will settle as it cools. Cool on a rack for 15-20 minutes, then release the ring of the springform pan. Allow the cake to cool, then refrigerate until cold. It's best to wait until the cake is cold to remove the bottom of the springform. Adapted from The Silver Palate Cookbook. Here's the cake on it's pedestal at the anniversary get-together. I wish you could smell it... it's SO good. I'd love to hear how your cake turns out! Cheers.